Hello! 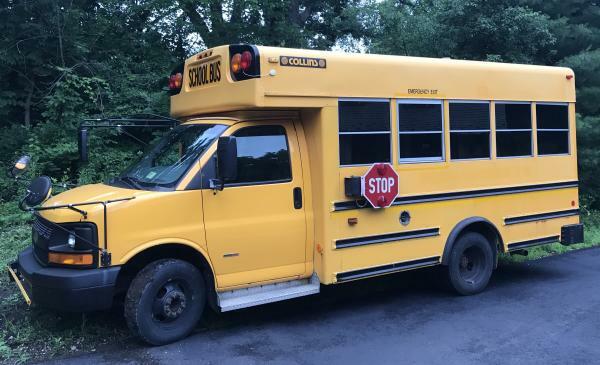 I just purchased a 2006 Chevrolet Collins 5 window bus. As in drove it home today. Many props to the terrifically knowledgeable folks here who have my mind running overtime on what is to be. Wouldn't you know that Jay, who drove me to the yard in the morning, has done several bus conversions himself! And used them commercially too. A real, living and breathing pro. He had plenty of useful suggestions and stories which made the drive super quick. His confidence in the project was calming and appreciated. My experiance at Midwest Transit was great overall. The test driver spoke plainly about a steering squerm and the bus' imperfections were detailed in their inspection. Note the inspection didn't include driving the bus, which I can see was an assumption on my part. Well, I signed some papers, watched the 100s be penned, received the temp tags and title, shook some hands and away I went. Just like that. Every mile closer was great news. It was an extra long 2.25 hour trip back due to highway tragedy that kept me on mostly county roads, an expanse of opportunity to have a situation. One time, approaching a bridge and about midway (meaning close to nothing), my heart sank when I smelled something not good. Thankfully whatever it was dissipated and I drove on. The only awful thing I noticed on the maiden voyage is the driver's chair. Horrible. A torture device. That has to go. Next, in order, is wow the bus is loud. First there is the road noise, by that I mean how much the thing rattles and booms at even the slightest imperfection. Then there is the engine. To the point where I could not always hear the directions on my phone even at max volume. There's a protrusion at my feet making for an awkward foot move when having to brake. Did I say loud? That's really it for the problems. Steering is great. Easy with one hand even in the world's most uncomfortable seat. I didn't notice any shimmying. My new friend Jay told me that he's seen vehicles not driven for a bit have sticky pistons and we both agreed that'd be a splendid resolution. As far as I can tell, he's right. Stopping in of itself is good too. OMG is that engine powerful: just to see what would happen, I pressed down the gas going uphill on a freeway already at 65 and wham! the bus downshifted and motored; I really left behind those loser slowpokes. It turns out there is diesel and biodiesel. Are they different? Yes that is how new I am to all this. Does the bus care? I don't know and, at the gas station which sold the latter and desperately searching for answers on my phone, acquiesced to simply not fill up until I had attained certainty. Here is a photo after the drive back. Tomorrow I register and start the tear-out. The goal is to be able to carry 11 people, their things and perhaps 2 days of food and water comfortably and safely during a 2 1/2 month trip. Once the building process starts, I plan to apply soundproofing mat, dynamat or something, all over the floor and to the area below the windows. Then closed call foam. Then painted plywood to which the to be built wood benches will be attached. I also am going to paint the thing to cover the "school bus yellow." To either side of the rear emergency exit will be shelving, though I don't plan on blocking the windows which I think are awesome. Maybe shelves across the back except I am leery of lowering the ceiling height. For sure a full length shelf on the driver's side up above the windows. Plus of course my mountain bike has to fit in there. There will be 3 benches: two shorties and one full width which will also convert into a bed. The walkway will be on the passenger's side (if there was one). And, obviously, that tragedy of a driver's chair needs replacing pronto. I have a couple of weeks. Next are on the hopefuls. This includes adding a battery in a box accessed from the outside of the bus and charged by the alternator with all the circuit breakers and other needed gizmos, a water tank underneath with some kind of pump action happening, and of course bug screens would be nice right? If there is a toilet, it'll be a simple all in one that some unlucky person gets to dump from time to time. I'll add the 110 plugs and stuff before the walls are put up for sure; I'm not sure if the second battery is going to happen prior to departure. Lastly, there is some under carriage rust to ameliorate. I sincerely hope to get advice and suggestions along the way. Please hold no punches! Welcome! Sounds like you've got plans for a fun rig! Looking forward to the project. 11 people with food, water, and a bike? In a 5 window shortie? I'd like to see your proposed floor plan. Cycle, thank you for checking in. DJ, the goal is just to move the 11 people and their things. Like the bus always has done except comfortable for larger folks. The one bench of the three that goes across is planned to turn into a bed. That's it though for RV-ing it until after the trip, meaning no shower, kitchen or anything like that. Sound more plausible? Gotcha, so really more for transport. That's much more plausible. I was trying to picture any way to have 11 people sleeping comfortable in a 5 window bus. I just got off the phone with the nice people in South Dakota, where I plan on registering, and emailed copies of the required documents to get the fees. So far so good! I read the "Register in Vermont" thread and it seems someone did the same out of state by mail registration in SD too. Heads up that not all SD counties register by mail. Brule does though and their number is 605-234-4436 if you're interested. The rain here is nuts. The river's flood plains are engaged! Time to measure for soundproofing materials order and get to work on the demo. I ordered a bunch of that Noico soundproofing Dynamat copycat stuff for the box, that mini me hood and probably the ceiling and high area by the back door. I want to do the firewall too. However, it will take too much time I think alas. Plus the roller. I had to go back and make a second order because the lowes here where I got a grinder since I can't fix the broken one didn't have one small enough and who likes playing Let's Look For It? Not me. Also got the stuff together to mail hooray! There is a spot here by the garage with close, outside power. Hopefully it'll be dry enough tomorrow to weed wack and make a parking place. Removed the seats and started on the rubber. I'm going to take the advice of the lift removal threads and see if the scrap place or some yard will get it out for its value. And what's wrong with SBY for a color? It does render one invisible. I got my beastie at Northwest Transit, too. What shop? Mine came from Kankakee. I had a wonderful time with them, although anything after a 34 hour Greyound/Jefferson ride would be a ball. They got Brunhilde up to 65 (her max) over county roads without a hitch. Mind you, I've got a LOT more room in mine. You should check with your local VFW, VA, and DAV to see if any vets want them if you were just planning on junking it.